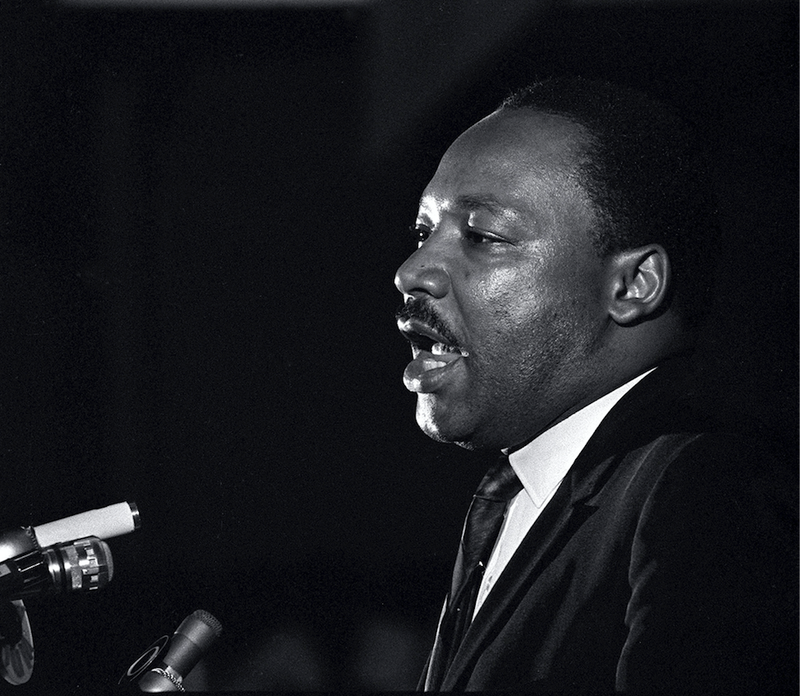 Martin Luther King Jr. makes his last public appearance at the Mason Temple on April 3, 1968, in Memphis, Tenn.
Those of us who study black history have always heard rumors of an alleged relationship between Martin Luther King Jr. (then known as “ML”) and a white woman in his younger days. Well, a historian found this woman and published a book about it, The Seminarian: Martin Luther King Jr. Comes of Age, which delves more deeply into their relationship ... just in time for the 50th anniversary of King’s murder. In an excerpt for Politico, Patrick Parr says that he’d first been intrigued by this young white woman after reading a 1986 biography of King, Bearing the Cross, by David Garrow. In it, Garrow describes a serious love affair between King and this woman named Betty while King was a 19-year-old studying at Crozer Theological Seminary in Chester, Pa. (he’d graduated from Morehouse that same year). From the start, Moitz and King’s relationship was anything but carefree. Almost all of King’s friends, including Reverend Barbour, tried to discourage him from staying with Betty, knowing what an interracial relationship would mean for his future. He outlines how the two met—King was a student and Moitz’s grandmother and then mother both worked as dietitians at Crozer. The family lived on campus, and Moitz, who studied at the Moore College of Art, would come to visit her mother often. And that’s where she met a brilliant young man from Atlanta. Who was actually quite conservative in his youth. “Crozer was known as a very radical religious institution,” she told Parr, “so I was surprised to hear from ML himself [that he] had more conservative beliefs. “He would talk, and talk and talk,” Moitz said. “He was worried what she’d think,” said Moitz. Eventually King went to a married friend for advice, Horace “Whit” Whitaker, who said he dreaded telling King his thoughts about the romance’s viability. “I’m not saying he wasn’t mature enough for that kind of experience, but I remember talking to him about that kind of marital situation … and we had talked about it from the standpoint that if he intended going back to the South and pastoring at a local church, that that might not be an acceptable kind of relationship in a black Baptist church, and I think he would be valuing that in light of whether or not it was a workable situation, knowing his own particular sense of call,” Whitaker said. We know that Coretta Scott King was the woman Martin Luther King Jr. eventually married.